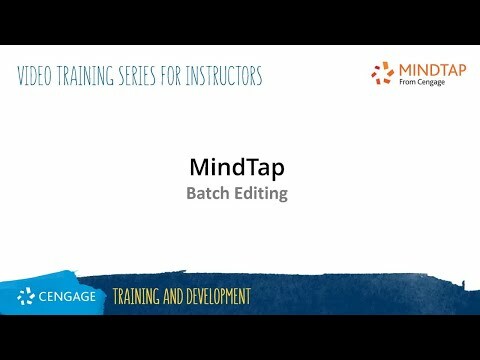 I have used Mindtap in previous semesters. But as I was updating for this fall semester, I realized that I can't find the view with the due dates. Where did it go? It will take some getting used to, but the helpful calendar features are still there. :-) I'm happy about that! I agree, I really liked the old date view myself! I am missing it very much, it was a very streamlined and simple way for students to track due dates. On the other hand, as much as I don't want to admit it, it's also true that there is a psychological principle at work that makes us resistant to change, so give it a few weeks and see if you still feel the same way. If you do, I think the best thing to do is to express your concerns to your learning consultant, if they hear from enough of us, they might bring it back. Thank y'all so much. But I really liked the date view. How are students supposed to know the due dates now? They removed the old "due date" view and replaced it with batch editing. If you select an item, at the bottom of the screen you will have an orange bar pop up with the batch options. There are now more options in setting the dates than before. I think you will like it once you get used to it.